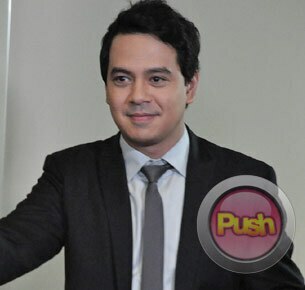 John Lloyd Cruz says it's all up to Sarah Geronimo if they will work together again. While John Lloyd Cruz is enjoying his successful team-up with Angel Locsin for the top-rating primetime teleserye Imortal, many fans are still hoping that the he will still do a movie with Sarah Geronimo. John Lloyd and Sarah'rsquo;s films A Very Special Love and its sequel You Changed My Life were both hits at the box-office. However, Sarah has expressed that she is no longer keen on doing another sequel because of the pressure of coming up with an installment that would be as successful as the previous two movies. But rumors claim that the real reason was that the Pop Star Princess still has personal issues with the actor-leading man. When reporters interviewed John Lloyd at the press conference of Imortal, he denied that there is animosity between him and Sarah. In fact, they would usually greet each other at the backstage of ASAP XV. "Nagkita kami sa ASAP pero she just congratulated me sa success ng pilot week ng Imortal. Aside from that wala na kaming napagusapang iba." Now that Sarah'rsquo;s primetime drama Idol is ending, there have been reports that she is now open to working with John Lloyd again for her next big screen project. When asked if he has any idea about his, John Lloyd said that he has yet to hear anything direct from Sarah. "Unless marinig ko from her, sabihin niya sa isang interview na okay na sa kanya. But for now na wala pa akong naririnig kaya mahirap pa mag-comment." Because of the hectic and fast-paced environment of ASAP, John Lloyd and Sarah barely have the time to chat and talk about the possibility of doing a movie again. John Lloyd fans need not worry because for his next big screen venture, he is paired with fellow big box-office draw Toni Gonzaga. There are also requests from fans for a project starring him and Kim Chiu, to which the actor reacted, "Kung gusto niya akong makatrabo mas gusto ko siyang makatrabaho."